Today, over 450 million people around the world play basketball. 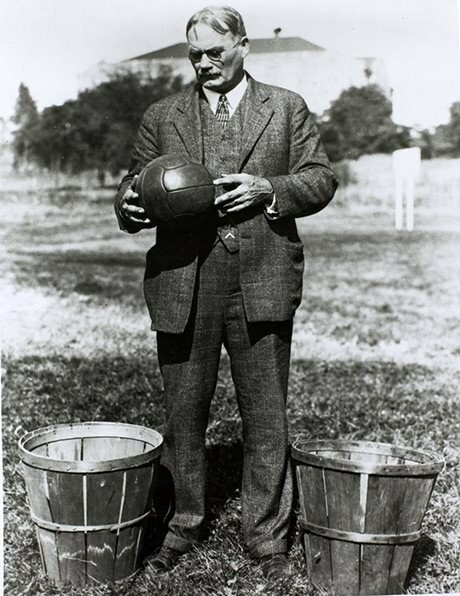 Dr. James Naismith (1861-1949), the inventor of basketball, created an inclusive game that could be played indoors. Born in Almonte, Naismith entered McGill University in 1883 and was active in athletics. In 1890, Naismith graduated in theology from Presbyterian College in Montreal, and subsequently enrolled at the International YMCA Training School (now Springfield College) in Massachusetts. There was a need for a competitive team sport that could be played indoors during the winter months and, in December 1891, Naismith devised a game that played under 13 basic rules – using a ball and two peach baskets. He directed physical education at the University of Kansas for 36 years and died at Lawrence, Kansas. Visit the Ontario Heritage Trust provincial plaque at 4968 County Road 29, Mississippi Mills, Ontario. Watch Historica Canada’s Heritage Minutes video on Naismith and the invention of basketball. Learn more about and visit Naismith’s childhood house in Mississippi Mills, Ontario. Visit the Naismith Museum and the Naismith Basketball Foundation.